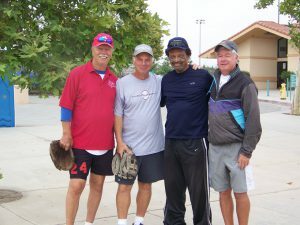 On April 11, 2011 at Wheat Field Park, the Monday League kicked off its inaugural season. Hugh Ord’s White Knights defeated Tom Fuhrman’s Red Bull by a score of 16-12. The 3/27/19 Board Meeting minutes has been posted on the Board Minutes page. Our next board meeting is scheduled for TBD at the Pizza Factory/TBD after BP at TBD (around 12:00 pm). Topics will include TBD. As always, league players are welcome to attend. The April 8 12:00 game, between the Blue Bolts and Better Red Than Dead, was moved to May 13 to facilitate replacing additional missing players unavailable due to the Carlsbad Tournament on April 8-9. Refer to Spring 2019 Schedule of Games – Rev. 7 under the Schedule & Standings page. Refer to Spring 2019 Schedule of Games – Rev. 6 under the Schedule & Standings page for April 1 changes. The February 11 rainout games were moved to February 25 and the single-elimination tournament to June 17. The AED training clinic was moved to March 11. Refer to Spring 2019 Schedule of Games – Rev. 5 under the Schedule & Standings page. The February 4 rainout games and AED training clinic were moved to Week 6, March 4. The 4 Week 6 games were moved to later in the season requiring local teams to play a second doubleheader. Refer to Spring 2019 Schedule of Games – Rev. 4 under the Schedule & Standings page. An AED training clinic on the use of the defibrillator is scheduled for Monday, February 4 at 10:30 am. The 10:30 and 12:00 games will slip a half hour. Mike Fagan will conduct this training clinic. All 8 teams will be playing on that date. Also, Week 10 and Week 11 games were flip-flopped to avoid a conflict with North County’s games and the start of the North County Classic Softball Tournament on April 8. Refer to Spring 2019 Schedule of Games – Rev. 3 under the Schedule & Standings page. Because the fields were unplayable on Saturday, January 19 due to the recent rain, the MLK tournament originally scheduled for Sat-Sun (January 19-20) was slipped to Sun-Mon (January 20-21). the 12:00 game, originally schedule for Week 2, was moved to Week 3. Refer to Spring 2019 Schedule of Games – Rev. 2 under the Schedule & Standings page. The January 14 games are RAINED OUT. The Spring 2019 Season will slip one week and start on January 21. The single-elimination tournament will slip 2 weeks due to the Memorial Day holiday. Refer to Spring 2019 Schedule of Games – Rev. 1 under the Schedule & Standings page. The 2019 Spring Season schedule, standings, rules, rosters, and player rating have been posted on their respective pages. None of the “2019 SSUSA Rule Changes” were adopted by MVUDSS. On the replica fields: (1) in games involving out-of-area teams vs. local teams, both teams will hit from the infield, and (2) in games involving local teams only, both teams will combine to hit from the right field corner. On the minor league fields, either (1) or (2) above is OK independent of the teams involved in the game. It appears that some may not be aware that league historical information such as pictures, archives (final standings, playoff/tournament results, a brief summary article for every season), disabled veterans tournaments, an In Memoriam page, etc. can be found on the Archives page under “Useful Links”. There seems to be some confusion as to which fields are BLD1 and BLD2. As you are aware, a sign is posted at the entrance to the park indicating which of the six fields we will be using. The first field listed will be BLD1; the second field listed will be BLD2. After the last game on a given field, the local home team will be responsible for taking down the pitching screen and giving it to Steve Baranick or one of the other Board members. However, if the last game involves only one local team, that team will take down the screen. A new page identifying businesses and services provided by some of our players has been added to this website. If you’d like to advertise, please give your business card to Steve Baranick. Refer to the Businesses/Services page under “Useful Links”. The 8-team Spring 2019 14-game regular season will start on January 14, 2019 and will run through May 13, 2019; followed by a single-elimination tournament on May 20, 2019. There will be one doubleheader for each of the 6 local teams in the initial schedule; however, this may change and/or the season may even be extended a week or two to make up games such as rainouts/cancellations. We will be playing on MLK Day. We will not be playing on Presidents’ Day or Memorial Day. All teams will be seeded based on the SSUSA seeding criteria. All eight teams will play a post-season single-elimination tournament. Teams may pick up players from the league players, the waiting list, or the player pool. The higher seed will have its choice of home or visitor. Separate awards will be presented to the regular season champions and the tournament champions. 16. Base Runner Safety Rule: … The runner must reacquire the vacated base before he can advance to the next base, but need not return to the base between pitches. Refer to Rules-Spring 2019 under the Rules & Policies page. $45/player for all 8 teams. Fee due Monday, January 14, 2019. Make checks payable to Steve Baranick or Joe Hansell. DO NOT make them payable to MVUDSS. The Monday league board of directors has unanimously agreed that pitching screens are to be used only for Monday league games, batting practices, and other league-sanctioned events. They are not to be used for any other purpose. No Games on April 22 and April 29. Several rule changes/clarifications were approved by the SSUSA Rules Committee and went into effect on December 1, 2018. MVUDSS reviewed, but did not incorporate the following rule change into its spring 2019 season.